Bobby Clarke (right) was a player/assistant coach for the 1979-90 Flyers. “Clarke was the greatest leader I’ve ever seen,” Flyers coach Fred Shero once said. In a six-part year-long series, we’re looking at the best local teams that never won a championship. 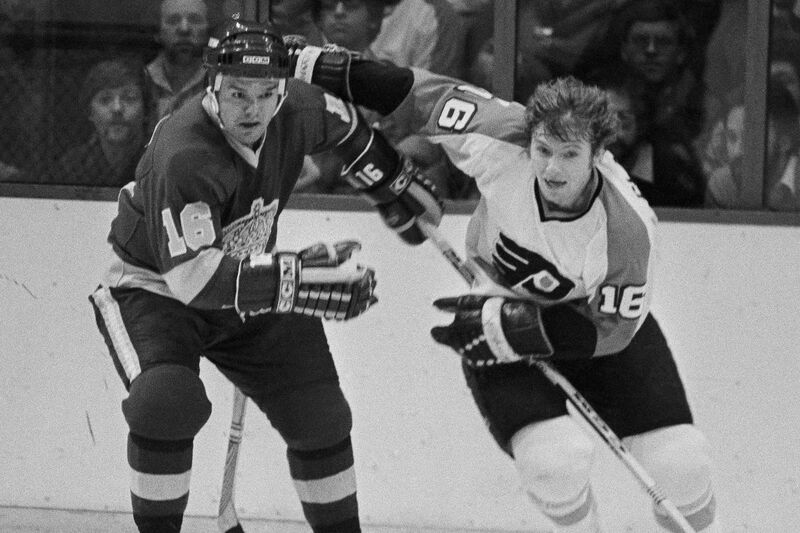 The keystone to the Flyers’ two Stanley Cups, the gritty center from Flin Flon, Manitoba, remained the face and heart of the franchise as the 1980s neared and a new style of play was introduced. After averaging 100-plus points for the previous six seasons, Clarke’s total had slipped to 73 in 1978-79 and there was concern that the relentless penalty-killing he’d undertaken throughout the Broad Street Bullies era had exacted a physical toll on the 30-year-old diabetic. Looking for ways to ease his star’s load on the ice and utilize his leadership abilities off it, coach Pat Quinn made Clarke a player/assistant coach before the 1979-80 season. And while Clarke’s numbers dipped (12 goals and 57 assists), the team responded. “Clarke was the greatest leader I’ve ever seen,” Flyers coach Fred Shero once said. A three-time MVP, he is still the team’s all-time leader in points, assists and games. A first-round draft choice (seventh overall) in 1972, the left-wing sniper was 27 in 1979-80 and in the prime of his career. Barber would score 40 goals that season, second to Reggie Leach’s 50. Many came at clutch moments. In the Flyers’ postseason run to the ’80 Stanley Cup finals, he scored three shorthanded goals. And he had the game-winners in 11 victories, four during the playoffs. An all-around player who killed penalties, could find the open man and played smart defense, he is the Flyers’ all-time goals leader with 420. Barber was one of two future Philadelphia coaches (Paul Holmgren) and two future hockey Hall of Famers (Clarke) on the roster that 1979-80 season. Rick MacLeish during the 1979-80 season. A fluid skater and a natural scorer who came to Philadelphia from Boston as part of a three-way trade in 1970, MacLeish averaged 40 goals a season for the Flyers between 1972-73 and 1978-79. By far the most notable of those came on May 19, 1974, in Game 6 of the Stanley Cup finals. His first-period goal would be the only score as the Flyers defeated Boston, 1-0, to win their first NHL championship. “Ricky was the most talented player the Flyers had during the 1970s,” Clarke said. Though Philadelphia shifted to a more defensive style in the ’79-’80 season, he still managed 31 goals and 35 assists. Suffering from various medical conditions, MacLeish died in 2016 at age 66. When, in 1972, GM Keith Allen needed a defensive “bully” to complement those he was assembling up front, he acquired the Quebec native from St. Louis. Dupont became both a blue-line fixture during the Cup years and, thanks in part to the “Moose Shuffle” he performed after his infrequent goals, a favorite of the 17,007 fans who filled the Spectrum for every game. His best and only All-Star season came in 1976 when he accumulated 276 penalty minutes in addition to 21 assists and a career-best 11 goals (11). His playing time and numbers (1 goal, 7 assists) would diminish in 1979-80 and that offseason he was sent to Quebec for cash and a 7th-round draft pick. Aggressive and high-energy, the “Hound” was an enforcer and igniter for the 1970s Flyers. While he topped 20 goals just once in 10 Philadelphia seasons, that wasn’t his role. Initially a winger on Clarke’s line, the swift-skating Kelly morphed into a physical player whose primary role was to animate his team and the crowds that came to watch them. When Shero called his number, he’d leap the boards and start pinballing himself around the ice. “If Kelly scores 20 goals, I’m not using him right,” Shero said. He’s got something that’s hard to come by. It comes from within.” Though the Flyers were no longer the “Bullies” in 1979-80, Kelly still collected 122 penalty minutes to go along with 15 goals and 20 assists. A defensive-minded defenseman, Watson was a cool and controlled presence on Flyers teams where those qualities weren’t always the norm. Just 21 when Philadelphia won its first Cup, he was paired for several seasons on the blue line with brother Joe, who was nine years older and as loquacious as Jimmy was quiet. Except for his rookie year, Watson had a positive plus-minus rating in every Flyers season, including a staggering +65 in 1975-76. His +52 topped the 1979-80 Flyers. Never one to seek the spotlight, he nonetheless made five All-Star teams during a career that injuries ended prematurely in 1982 when he was just 29.